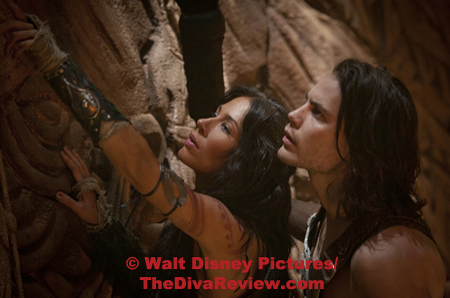 Edgar Rice Burroughs’ tale of time-travel and outer space comes to life in director Andrew Stanton’s John Carter. 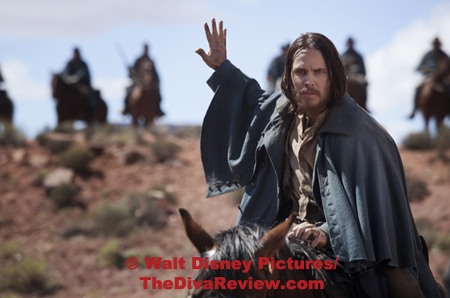 The film is based on the first book in Burroughs’ Barsoom series, A Princess of Mars, written in 1912. It seems an adaptation had to wait a full century before movie technology could give a full account of the fantastic world in the author’s head. It’s a shame then that John Carter isn’t good for much except proving that a big screen CGI onslaught is no substitute for a cohesive or intelligent script. 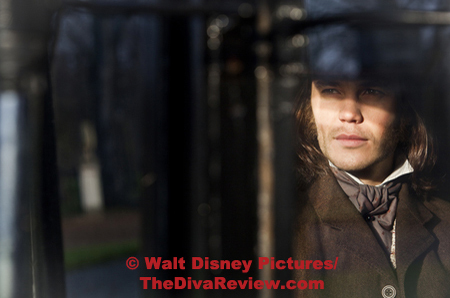 Sometimes in the late 1800s, a very strange thing will happen to a former soldier of the Confederate army. Having no life to go back to after losing the war, John Carter seeks gold in them thar hills and happens upon a cave full of it with a special jewel at its center. Contact with the trinket provides a very otherwordly experience and Carter is suddenly not in Arizona anymore. Subtle changes like his ability to leap tall buildings in a single bound and super strength let him know things are very different. His eventual run-in with some tall, green grasshopper-like pursuers is also a big clue something odd has occurred. Captured by the Tharks, an insectoid, six-armed race of nomads, Carter is given the ability to understand their language thanks to a kindly minder and he learns that the jewel he touched has somehow transported him many miles from home to the planet Barsoom, which he knows as Mars. The novelty of this little creature with massive power endears Carter to the warrior tribe and he becomes an ally to their leader. Carter has arrived in the midst of interplanetary strife, the Tharks are a downtrodden, feared race in constant war with giant, white apes and the more humanoid red Martians, who are themselves embroiled in drama. Princess Dejah of the land called Helium is being cornered into a political marriage which gets a big thumbs-down from her. 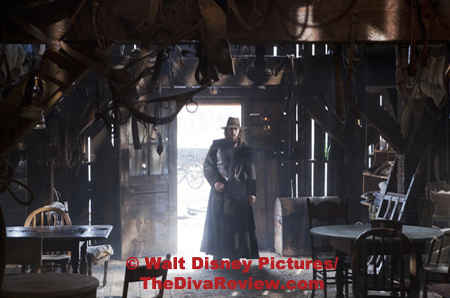 Dejah’s attempt to escape her unwanted fiancé brings her across the path of the Tharks and one John Carter, who discovers the princess is not only really pretty, but may hold the key to his getting back to Earth. Andrew Stanton is primarily known for his long association with Pixar Animation Studios and directing such hits as Finding Nemo and WALL-E. One would reckon Stanton to be very familiar with the cinematic fantastic and making impossible worlds come to life. Unfortunately, in his first live-action project, Stanton shows that he’s much better working with pixels than people. 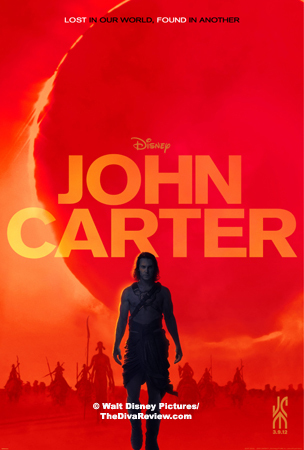 John Carter is an unruly mess with a confusing script, characters with only the barest development (and wardrobe, but hey) and a running time that will make the audience feel as if an actual trip to Mars would have been shorter and less disorienting. A scorecard and glossary should be handed out with every movie ticket, because they’re sorely needed. 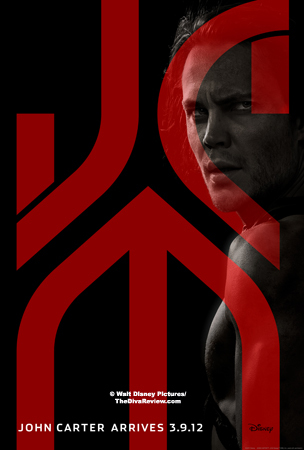 As if purposely generic, John Carter may be the only name viewers will recall out of the baffling mess of red planet characters with monikers like Dejah Thoris, Tars Tarkas, Tal Hajus, Matai Shang, Sab Than and Kantos Kan, and provinces called Helium and Zodanga. It doesn’t help either that the Tharks all resemble slightly beefier, Na’vi versions of Slim, the Walking Stick insect from A Bug’s Life. There are these bald shape-shifter guys who pop up in our hero’s time on Earth as well as on Barsoom and seem to not like Carter and Princess Dejah very much, but I couldn’t tell you why. There’s something about a big secret that Princess Dejah discovers that’s a threat to the current political power, but it’s all lost in the barely comprehensible script. Don’t even get me started trying to figure out the time-travel aspect because I don’t enjoy nosebleeds. It’s an odd thing because there’s all these subplots and characters, yet the writing of the John Carter script seems very much for children: The dialog, when one can understand what’s going on, is simple to the point of dullness with many unintentionally laughable lines. The performances are so broad most of the actors seem to simply be yelling their lines at each other instead of giving them any kind of life. 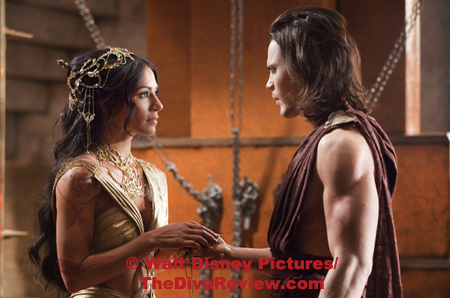 This is very much the case with the excellent Lynn Collins (From the heartbreaking Angel’s Crest) as Princess Dejah, who overacts wildly, in part, I suspect, to make up for the deficiencies of her handsome but vapid leading man, Taylor Kitsch; who costarred with Collins previously in X-Men Origins: Wolverine. Kitsch sports the same hairstyle he wore as Gambit from that film, but a lot fewer clothes. 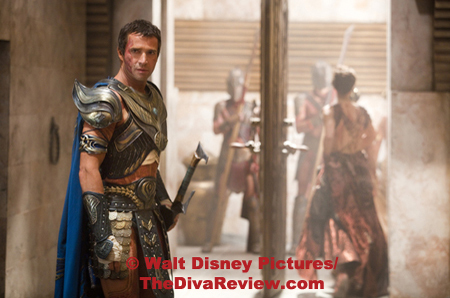 John Carter’s great supporting cast, featuring Mark Strong, Ciarán Hinds, James Purefoy and Dominic West, really have nothing to do but tramp about in silly costumes and splashes of red body paint. 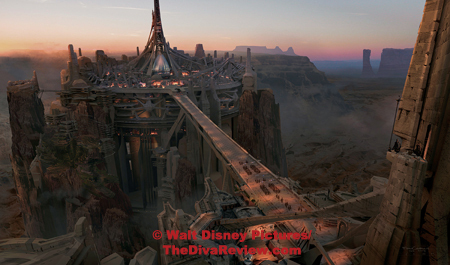 Perhaps owing to Stanton’s Pixar past, the only interesting and memorable characters are the CGI ones, notably the daughter of the Thark chief, who becomes John Carter’s keeper and the provider of the movie’s few common sense moments. 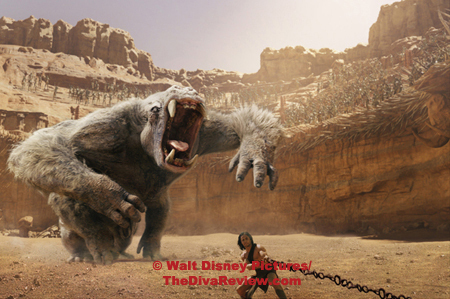 And then there is Woola, a big dog/lizard thing from the Thark encampment that takes a big liking to John Carter. Despite his fluffy, bulky appearance, Woola can match Carter in super-speed, run miles across the desert and saves the other characters’ hash from time to time. Woola steals the picture singlehanded, or rather decahanded, cos he/she/it’s got ten legs. Obviously, the other characters in the film have no personality because it was all given to Woola. If John Carter had been two hours and twelve minutes of Woola just running around the screen, I would have been a happy camper, but sadly it isn’t. Any moment that didn’t feature Woola left me bored and frustrated with the murkiness of what I was watching. Still, even the antics of the fabulous Woola won’t be enough to prop open the eyes of the young kids in the audience, who will ostensibly be the only people to enjoy this movie. Surprisingly, even the special effects-heavy action and look of the CGI world are nothing to write home about; I can think of twenty video games with better visuals and thrills and any of those would be more involving and entertaining than this flat tire of a film. While we have a cutesy bookend wherein Edgar Rice Burroughs appears onscreen as John Carter’s nephew and the discoverer of his uncle’s diaries which unspool this tale, I reckon the real Burroughs wouldn’t be particularly thrilled with what’s become of one of his most influential works. 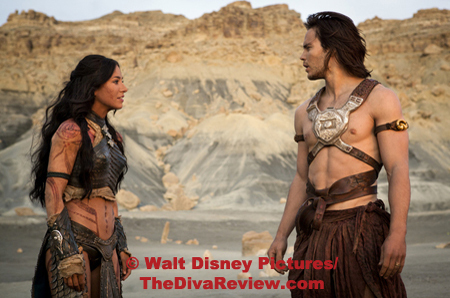 John Carter is a misguided, muddled mess that should’ve waited another hundred years for a good script.